One of the most commanding and breathtaking views of the old walled city of Jerusalem is from the Mount of Olives. As one looks across the Kidron Valley, the Valley of the Dead (a huge ancient cemetery littered with stone tombstones), one can take in the whole breath of this panoramic view, with the cupolas and domes of the major religious shrines rising above the whole Eastern wall of the City. There is one large gate that stands out on the Eastern wall. It was formerly known as the Golden Gate because it was covered in golden coloured bronze. The gold and the bronze had long disappeared. But what remains remarkable about this Gate is not only its formidable size but the fact that it is sealed up. Obviously, the reason is not to keep the inhabitants in the City locked up within its walls – there are other gates that provide easy entry and exit. A little thought on the matter will suggest that it may have been walled up to keep someone out. But who? Let’s return to the story of the first Palm Sunday. No one can be positive about which gate Jesus came through, although it is likely it was the Golden Gate. 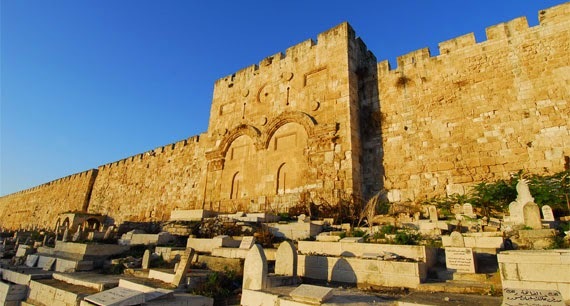 Jewish tradition had long declared that when the Messiah came, he would enter the Holy City from the East, the direction of the Mount of Olives, through the Golden Gate. But many years later during the reign of the Ottomans, Suleyman the Magnificent made it impossible for anyone to go through the Golden Gate any longer. He ordered that the two huge doorways be sealed, and piled rocks and dirt over the roadway up to the gate. And to be certain the coming Messiah would not enter through that prophesied gate, they built a cemetery right in front. Surely, the Messiah would not walk through a cemetery of graves and risk defiling himself. Thus they supposed they were thwarting two rival religions: Judaism, because their Messiah couldn’t enter Jerusalem by the traditional gateway whenever he might come, and Christianity, because their Christian Messiah in his Second Coming could not return to Jerusalem if the Golden Gate was sealed shut. Little did Suleyman realise that the Messiah had already entered through that gate on Palm Sunday, and certainly no human barrier is going to prevent him from entering when He comes again in glory. But returning to that eventful day of Jesus’ entry into Jerusalem, no gates nor walls, no followers or detractors, no individual or crowd could keep him out. The disciples tried to prevent him from entering Jerusalem to avoid fulfilling his own self-predicted death. The Elders and the High Priests, who were visibly threatened by his ministry and believed that he was here to usurp their sacred authority over the people, were plotting his arrest and assassination. The Romans were nervous that his return to the City would be the spark to trigger off rioting mobs and perhaps a larger full-scale rebellion. He was certainly unwelcomed by these last two groups and they had closed the doors of their hearts to this Pretender to the Throne of David. I believe that if they had a chance, they would have walled up the Gate long before the Muslims thought of it centuries later. But then there were the peoples who lined the streets to welcome him - they were ecstatic. They were hoping to see their liberator and the political messiah who will rally the Jewish forces behind him to overthrow the shackles of their Roman oppressors, restore the throne of David and establish God’s sovereign kingdom on earth. But when Jesus turned out to be a major disappointment, when he chose to reject the path of violence and political change, when the kingdom he came to announce was not of this world, the crowds too closed their hearts to him. What is more daunting than a sealed Gate, is the closed doors of the hearts of these various individuals and groups. They thought they could keep him out. But no door can keep the Lord out. Not even a big rock blocking the entrance of a cave tomb could pose an obstacle, what more a sealed Gate. Doors can be closed on Jesus unwittingly, unthinkingly, as the disciples and the crowds did. Doors could also be deliberately closed due to fear and insecurity like the Elders, the High Priests, the Romans and the Ottomans after them. The enemies of Jesus tried everything to discredit him, insult him, cast all kinds of false accusations and calumnies against him, hoping to shut him out for good. Yet, none could shut out Christ for good – He came back! The door may be shut to Jesus from our side, but Jesus can still get through. The Ottomans were sorely mistaken. No gate can keep him out. No barrier can obstruct his coming. They should have learnt that important lesson from the Romans and the High Priests and Elders, who had also tried to keep Jesus from returning to his city. And so as we accompany Jesus into Jerusalem, as we follow Him to Golgotha and beyond, we are invited to throw open the doors of our hearts, because till now, the door of many hearts remain locked and barred, and bolted from the inside. We hear the refrain of that beautiful processional psalm of praise and jubilation that speaks of the entrance of the Ark of the Covenant into the Temple of Jerusalem, Psalm 23 (24). God, the King of Glory will be led to His Temple. On reaching the Temple, the bearers of the ark, the priests and other worshippers would literally summon the gates of the Temple to “lift up (their) heads,” and beckon these “ancient doors” to “grow higher” to admit the King of Glory to his throne. And so as we begin our Holy Week, we begin this liturgical climax of our Christian faith, we rejoice at the return of our King, our great and beloved prince, who would risk everything including sacrificing his own life in order to save his people. Shouldn’t this fill us with joyful ecstasy? Shouldn’t we be ready to throw the doors off the hinges of our hearts and remove every single barrier that will prevent our King from entering? Let’s not hold anything back, but open ourselves totally to accept the Lord as He comes. No sealed gate will stop Him. No closed heart will keep Him away. Not even a sealed Golden Gate can keep Him from entering. We already see today the King of kings, the one who at the end of this week after having by death abolished death, and brought life and immortality to light; after spoiling the powers of darkness, and ruining all their schemes; see him return in triumph! He has already paved the way. He has begun his redemptive plan for all creation. He has carried us on that donkey’s colt but more importantly, the burden of our sins to the cross. And at our life journey’s end, he will carry us out of the tomb.